Today, the British startup Electric Jukebox Company announced a new music player and service that it says will appeal to the 160 million people who used to buy CDs, but who haven’t made the switch to streaming services like Apple Music and Spotify because those products and their hardware requirements are too complicated and too expensive. Stay with me. This gets even more interesting. The Electric Jukebox is one part on-demand music-streaming service and two parts hardware: A dongle that you plug into your TV’s HDMI port, and a wand-like controller with a built-in motion sensor and microphone. Plug the dongle into your TV, and a simple home-screen appears with three icons: My Music, Discover, and Search. 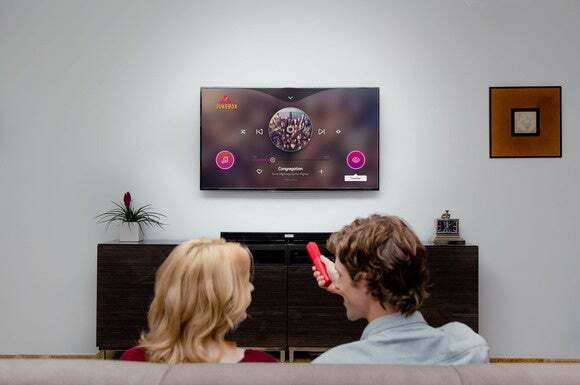 Using the wand to interact with the software and the mic to perform voice searches for your favorite artists, songs, and albums, you can sit in front of your TV and stream an unlimited number of tunes from the cloud. That’s right. The only way you can use the Electric Jukebox is when you’re in front of your TV. There is no web client for your computer. There is no mobile app for your smartphone or iPod. You won’t find an Electric Jukebox app on your next smart TV, set-top box, or A/V receiver. There’s no multi-room option. There is no sharing what you’re listening to on social media. It’s as if the last 15 years of change in the music industry never happened; well, except for the part about not having to buy records anymore. Does anyone listen to music this way any more? It would be easy to dismiss the Electric Jukebox as a misbegotten joke, but the company’s management team is stacked with some very heavy hitters who are extremely passionate about this product. And when you hear their ideas, you realize they could be on to something. 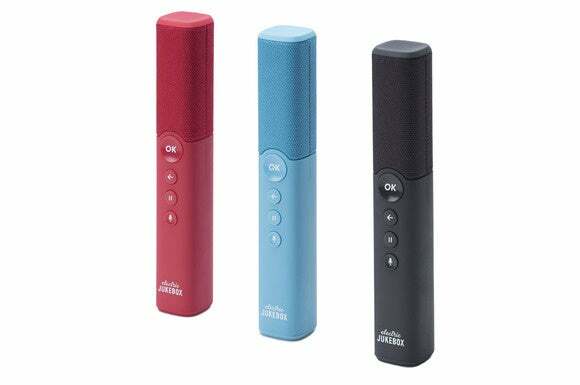 Personally, I can’t imagine ever buying an Electric Jukebox for myself, and I expect most tech-savvy readers feel the same way. But just because this product wasn’t designed for us doesn’t mean it won’t appeal to people who care just as deeply about music, but who aren’t as willing to adopt new-fangled technology to get it. Electric Jukebox Company CEO Rob Lewis founded Omnifone, which provides cloud-based music services to a number of companies, in 2003. Chairman of the Board Sir Malcolm Williamson is a former CEO at Visa International. The board also includes former CEOs, CFOs, and chairmen from EMI Music and Island Records. The privately funded company has been working on this project in stealth mode for more than two years. Lewis explained in a telephone interview last week what inspired him to create the Electric Jukebox. The Electric Jukebox controller has a motion sensor and a microphone built in. You’ll be able to search for the music you want to listen to by speaking the name of the song, artist, or album into the Electric Jukebox controller. There’s never a need to peck at on onscreen keyboard, and you don’t need to worry about spelling. Search results appear on the TV and you’ll wave the controller in the air to move a selection cursor on the screen. The controller has just four buttons: OK, Mic, Pause, and Back. But when the selected album or song ends, so does the music until you make another selection. They might want to rethink that. 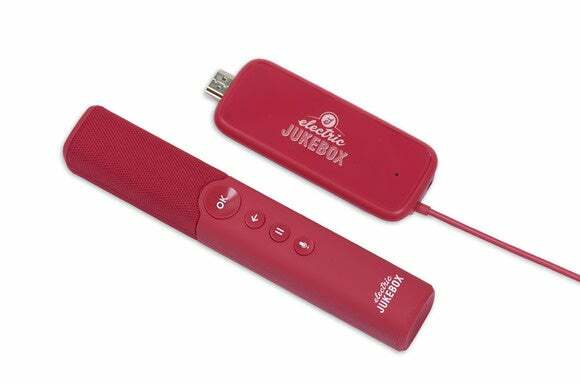 The Electric Jukebox will also offer curated playlists (these will be called “mix tapes”) and curated radio stations. The company has announced five artists as curators: American singer/songwriter Sheryl Crow; British recording artist and actor Robbie Williams; American actress Ayda Williams (who is married to Robbie Williams); British comedian and actor Stephen Fry; and singer/songwriter and Britain’s Got Talent judge Alesha Dixon. You plug the HDMI dongle into your TV and the user interface appears on the screen. You can either use the TV’s onboard speakers or connect your TV to a soundbar or A/V receiver. 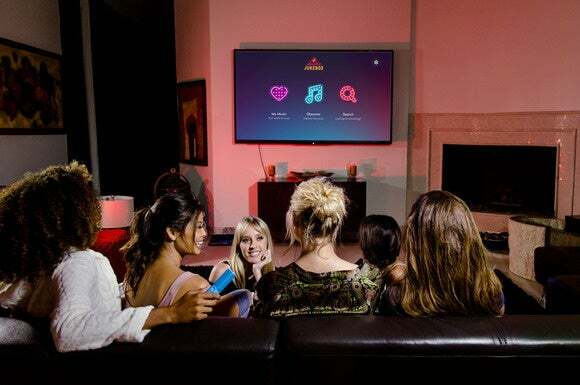 Well, here’s hoping those TVs are connected to at least a soundbar so that Electric Jukebox buyers don’t subject themselves to the sonic horrors of the speakers in a typical flat-screen TV. Thanks to the Audio Return Channel first introduced with the HDMI 1.4 standard, audio can travel upstream from a TV to a soundbar or A/V receiver using a single cable. I’ve covered some of this earlier, but here are a few more facts you should know. Before you pre-order one for your parents, know that the HDMI dongle needs a Wi-Fi router to connect to the cloud. If there’s no Wi-Fi in the house, there’s no music. That’s not an exceptional requirement by any means, but the Electric Jukebox is not quite as stand-alone plug-and-play as the company makes it out to be. On the other hand, as Lewis points out, there is no login ID or password to remember and no subscription to manage. If you want to continue the music-on-demand feature after one year, you just buy another one-year music pass (via the app on your TV screen or the company’s website). You’ll still get curated music and radio without the pass, so the hardware doesn’t become useless after a year. The Electric Jukebox Company believes people want to make music listening a shared experience once more. The onscreen app uses HTML 5, “so there are no software updates, ever,” Lewis said. And the wireless controller communicates with the HDMI dongle using DECT, a wireless standard originally developed for cordless phones. “We found it to be better than Bluetooth because you don’t need to pair the two devices,” Lewis said. DECT operates in the 1.9GHz frequency spectrum, so it won’t interfere with your Wi-Fi network. The Electric Jukebox costs $229 ($199 if you pre-order before midnight October 21) and includes a one-year Music Pass that’s worth $60. Lewis said the music streamer would ship well ahead of Christmas. So what do you think? Will you consider buying one of these for yourself or for a friend or family member? Or do you find the TV limitation too restrictive? Let us know in the comments section, below. Correction: Sky did not acquire Omnifone, it remains a privately held company.